Adrenal Rebuilder is a great! Been dealing with adrenal insufficiency after long term hydrocortisone usage. Building Blocks for Stress Hardiness! When your adrenal glands are overworked by stress‚ both their function and structure can benefit from targeted‚ natural support. 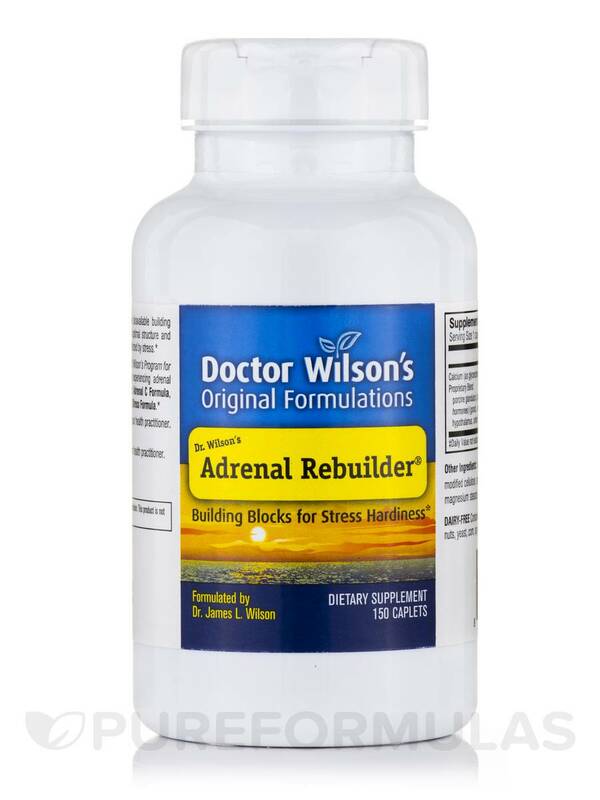 Dr. Wilson created Adrenal Rebuilder® to provide naturally bioavailable building blocks your body can readily use to support healthy adrenal structure and promote optimal function of your adrenals and the other endocrine glands affected by stress. Your adrenal glands respond to every kind of stress you experience by producing and secreting hormones such as cortisol and adrenaline that regulate many essential processes in your body. Stress can fatigue your adrenals‚ causing adrenal hormone levels to drop (adrenal fatigue). When your adrenal glands are overworked by stress‚ the resulting biochemical and cellular changes can affect many systems in your body such as immune function‚ blood sugar balance‚ energy production‚ thyroid function‚ and hormone balance‚ among others. Specific‚ targeted supplemental support can aid in maintaining healthy adrenal tissue structure and function‚ and contribute to overall good health and vitality during times of stress‚ as well as to your ability to handle additional stress. Dr. Wilson designed the products in his Program for Adrenal Fatigue & Stress to work together to provide the specific targeted support that optimally fosters healthy adrenal function and structure. Adrenal Rebuilder is the foundation product in this program and the cornerstone support for health during adrenal fatigue and stress. Adrenal Rebuilder is an example of how Dr. Wilson’s formulating expertise has allowed him to considerably improve on adrenal supplements that were available when he was writing his book about adrenal fatigue and stress. This is a unique formula containing concentrated glandular extracts that provide important building blocks for the adrenal and related endocrine glands. These concentrates are carefully selected‚ processed to be free of hormones‚ and combined in precise proportions to best facilitate building and maintaining healthy adrenal tissue and function‚ while also supporting the other endocrine glands affected by stress. The precise combination of ingredients that makes Adrenal Rebuilder succeed where other adrenal products have failed is the result of hard won insights gained by Dr. Wilson during his twenty-nine years of clinical and research experience. It has been known since 1918‚ when the first adrenal tissue extracts became available in the US‚ that the most effective way to support the health of people experiencing adrenal fatigue is to have them take adrenal cortex glandular tissue along with the tissues of supporting endocrine glands. Dr. Wilson found that adrenal cortex from high quality porcine (hog) sources that has been processed to remove the hormones produces the best results. In addition to a generous amount of adrenal gland concentrate‚ Adrenal Rebuilder contains high quality‚ hormone-free hypothalamus‚ pituitary‚ and gonad concentrates in the proportions that provide the greatest support for those experiencing stress and adrenal fatigue. Porcine glandulars (processed to remove hormones) (Gonadal‚ adrenal cortex‚ hypothalamus‚ anterior pituitary)‚ inositol. Other Ingredients: Dicalcium phosphate‚ cellulose‚ modified cellulose‚ stearic acid‚ magnesium stearate‚ food glaze and micro wax. Contains no milk‚ dairy‚ egg‚ sugar‚ salt‚ wheat‚ gluten‚ nuts‚ yeast‚ corn‚ soy or artificial coloring‚ flavoring or preservatives. 1-4 caplets daily or as directed by your health practitioner. Take consistently for at least 6 months. If pregnant or nursing‚ use according to directions from health practitioner. Keep out of reach of children. Store tightly closed in a cool‚ dry place. I take this Adrenal Rebuilder by Dr. Wilson's Original Formulations 5 times times per day. It has been instrumental in helping my adrenals to function. I like that it works. It is the only adrenal supplement that I have been able to tolerate. I've had adrenal insufficiency since 2009 and I still rely on this Adrenal Rebuilder by Dr. Wilson's Original Formulations. I like that it does not contain hormones so that it doesn't inhibit hormone production. I wish it was a vegan product, but unfortunately I can't handle a lot of herbs like ashwagandha which makes me dizzy. But I can't fault the product for that. This is an animal product. 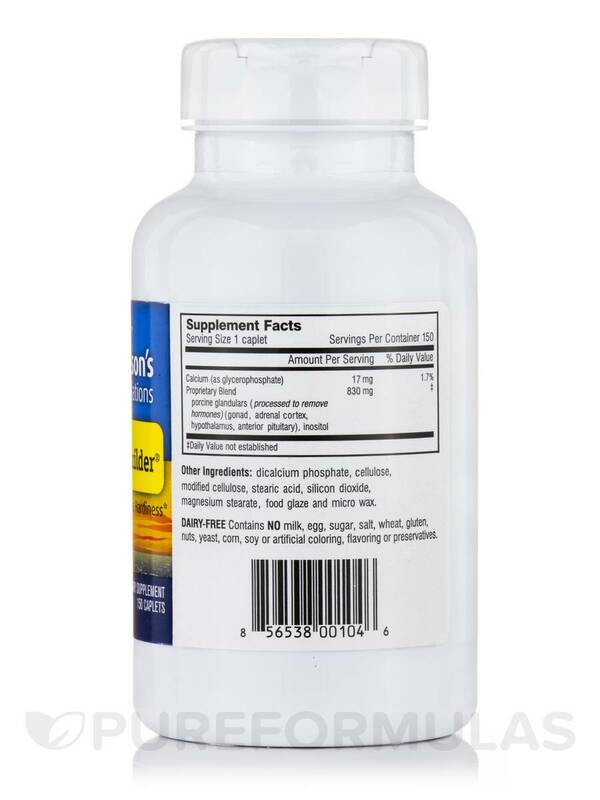 I ordered Adrenal Rebuilder by Dr. Wilson's Original Formulations because my adrenal glands are exhausted. I've been using it for about 5 months and am satisfied that using it along with adrenal cortex is keeping my adrenal glands from crashing altogether. I also use coenzyme B Complex, as that is necessary to help the glandulars work efficiently. If your adrenal glands are in really bad shape you may have to take quite a few. I take 2 at 4 times a day, but my adrenal glands are pretty much shot. Delivery from Pure Formulas is fantastic. Although these come in tablet form, they are not nasty to taste and are soft enough to chew up. I ordered Adrenal Rebuilder by Dr. Wilson's Original Formulations for my husband. It has been recommended by our naturopath doctor and practitionist to help boost his adrenals since he is usually dragging by mid-day. Delivery from this site has been quick and my husband and I have been satisfied with our purchase. Helps boost my husband's adrenals which helps him through the afternoon lows so he can work long hard hours. It's pretty pricey. This is the best price we can find though. 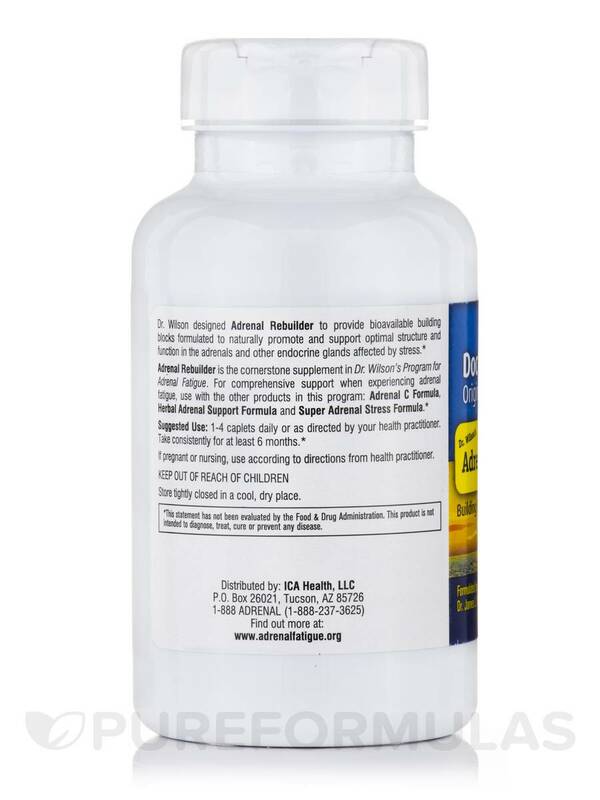 Adrenal Rebuilder by Dr. Wilson's Original Formulations is a great adrenal support! Adrenal Rebuilder by Dr. Wilson's Original Formulations is a really great product and was the one thing that really helped fast track my recovery. 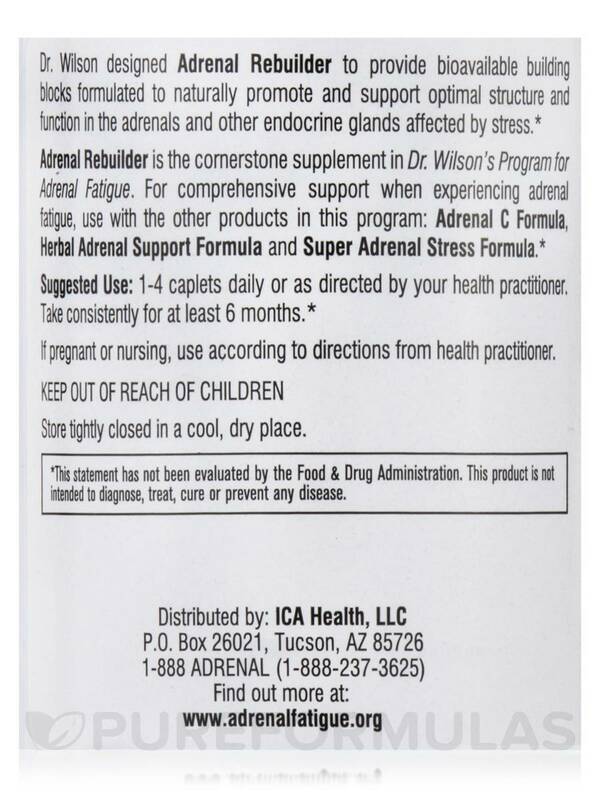 I take Adrenal Rebuilder by Dr.Wilson's Original Formulations and Super Adrenal Stress Formula. I find them to be supportive of the other things I'm doing to take care of my health. For me they aren't a miracle supplement. They are quietly there as part of my support team. 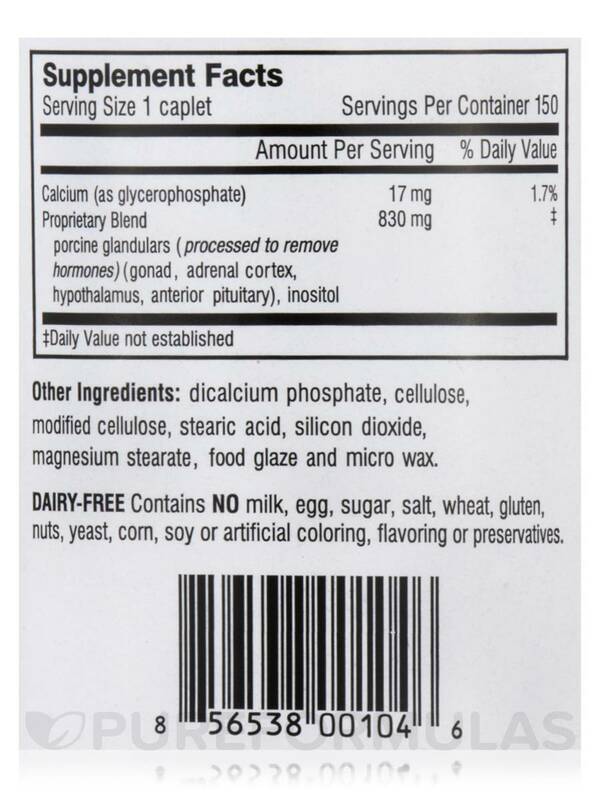 This product contains unique ingredients to support my adrenals. I like that they get the ingredients from "clean" resources. The manufacturer has lots of interesting info to read on their website. Helps support me as I deal with the stress in my life! The price is too hight!! That's why I gave one less star in my review. It's not covered on health insurance. I will say PureFormulas has the best price and free shipping. I have some adrenal fatigue along with a bunch of other problems.... I've been looking for a good product and Adrenal Rebuilder by Dr.Wilson's Original Formulations is it for me. Because of all the other issues I have it is not a miracle for me, but it helps me some. After the first month of 3xday I was able to pee like a normal person instead of every 30 min, and my blood pressure is normal instead of very low. After 6 months of 3xday I'm taking one a day unless I have something stressful going on. It seems pricey, but is worth it. I'll always have some in hand. For me is not hard to swallow it! Adrenal Rebuilder works for me! Essential for improving adrenal function. Have used Adrenal Rebuilder by Dr. Wilson's Original Formulations for over 3 years. Can Dr. Wilsons adrenal rebuilder cause a sour-acid stomach? Annette, unfortunately we do not have the details from the manufacturer as to what the side effects may include. We suggest contacting your health care provider with this question to see what would be best for your health needs. Can I cut or crush adrenal rebuilder caplets?swallowing issues? Hello, thank you for contacting PureFormulas. If you would like you can try contating the manufacturer of the product.